Did Head Injuries Cause Henry VIII’s Bad Behavior? Head injuries are a pretty big deal at the moment. Between the lawsuits brought by ex-players against the NFL and the piles of research exposing the long-term consequences of concussions, it’s hard to ignore the dangers inherent in contact sports. We know now that repeated traumatic brain injuries (TBI) can lead to aggression, mood swings, depression, headaches, and amnesia—conditions that just happen to have plagued Henry VIII. A team of neurologists outline the evidence in a forthcoming paper in the journal Clinical Neuroscience. Mental_floss received a copy of the paper in advance of its publication. From all accounts, as a young man, Henry was a pretty happy dude, and a pleasure to be around. By 1536, he was decidedly … not. 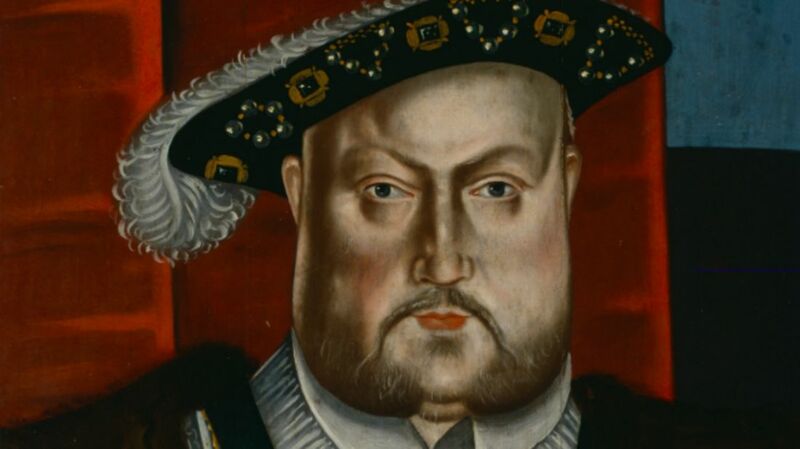 The King Henry VIII we think of today was a bloodthirsty tyrant, impulsive, unpredictable, and murderous—the kind of man who would send two of his six wives to the executioner. So what happened? This isn't the first time researchers have proposed a medical explanation for the king's dramatic transformation. Cushing syndrome, syphilis, hypothyroidism, diabetes, and McLeod syndrome with infertility and psychosis have all been suggested as the cause. Historians generally agree that Henry sustained at least three serious blows to the head. In 1524, the lance of Henry’s jousting opponent pierced the king’s visor and splintered against his face. The king fell off his horse, recovered, got back on, and went back to jousting. Just one year later, while out hunting, the king decided he would pole-vault over a hedge, like you do. But the pole broke, and Henry fell into a ditch full of water. He was too out of it to stand, and had to be dragged out by his feet. But the most severe blow came in 1536, during another jousting match. Henry was unhorsed. He fell to the ground, and his horse fell on top of him. The king was out cold for two hours. That same year, Henry’s reign of terror commenced. His unpredictable, inexplicable explosions made him the terror of his own court, for he was just as likely to order the execution of a friend as he was a foe. His behavior was erratic and violent, and he often flew into rages for reasons that were unclear to those around him. He became impulsive—and if you need more evidence of that, just look at his six marriages and two dispatched queens. Henry started suffering bouts of bizarre amnesia, which led to dangerous contradictions in his commands. As the city of Boulogne was under siege, Henry reportedly demanded on paper that the city be protected, while saying aloud he wanted it to be demolished. In 1546, the king assured his sixth wife Catherine Parr that he would protect her, forgetting that the day before he had ordered his guards to take her to the Tower of London.